Mesut Ozil has been a man who has courted much attention over the last few weeks. The German announced his retirement from international football, following much backlash over his political involvement with Turkey. 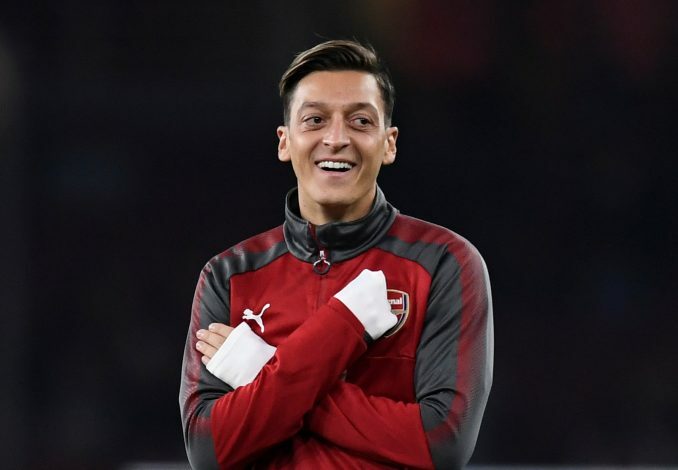 The situation transpired to reveal details of racism and marginalization of the 29-year-old, with the footballing world providing support to the Arsenal star. As of such, new Gunners’ manager Unai Emery showed a brilliant gesture to the playmaker when he named him as the side’s captain during their friendly clash with PSG in the International Champions Cup. Ozil went on to score the opening goal of the match in just 13 minutes, before the English side quite firmly decimated the French champions 5-1. However, the most interesting moment involving Ozil occurred much before kick-off. While both teams were warming up in the dugout, the referee approached Ozil. While most player-referee interactions are courted in controversy these days, this was one that was quite different. Footage showed the match-official asking for the player’s autograph, which was duly signed on a yellow card. The clip made its rounds on social media, and needless to say, supporters were quite chirpy at the fact that their favorite German was a favorite of the referee as well. Alexandre Lacazette found a brace, while Rob Holding and Edward Nketiah scored the rest of Arsenal’s goals, with PSG having to settle for a penalty by Nkunku as their sole respite. All in all, the gesture was a remarkable one, and in light of recent events, will be a sight to relish for the football world. Too much negativity has seeped into the great game, and while the sociocultural aspects are one that can’t be separated from the tactics on the pitch, perhaps at least here, the grime that envelops much of the world ought to be left alone and spotless.